This article is about the road vehicle. For the rail vehicle, see Covered goods wagon. For the preposition common in Dutch names, see van (Dutch). For other uses, see Van (disambiguation). A van is a type of road vehicle used for transporting goods or people. Depending on the type of van it can be bigger or smaller than a truck and SUV, and bigger than a common car. There is some varying in the scope of the word across the different English-speaking countries. The smallest vans, microvans, are used for transporting either goods or people in tiny quantities. Mini MPVs, Compact MPVs, and MPVs are all small vans usually used for transporting people in small quantities. Larger vans with passenger seats are used for institutional purposes, such as transporting students. Larger vans with only front seats are often used for business purposes, to carry goods and equipment. Specially-equipped vans are used by television stations as mobile studios. 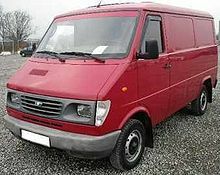 Postal services and courier companies use large step vans to deliver packages. Van meaning a type of vehicle arose as a contraction of the word caravan. 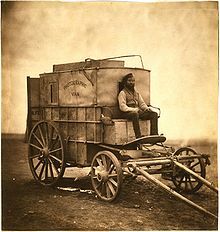 The earliest records of van as a vehicle in English are in the mid 19th century meaning a covered wagon for transporting goods (earliest reported record 1829). Caravan with the same meaning has records since the 1670s. A caravan, meaning one wagon, had arisen as an extension or corruption of caravan meaning a convoy of multiple wagons. The word van has slightly different, but overlapping, meanings in different forms of English. While the word always now applies to boxy cargo vans, other applications are found to a greater or lesser extent in the different English-speaking countries. In Australian English, the term van is commonly used to describe a minivan, a passenger minibus, or an Australian panel van as manufactured by companies such as Holden and Ford at various times. A full-size van used for commercial purposes is also known as a van; however, a passenger vehicle with more than 7 or 8 seats is more likely to be called a minibus. Finally, the term van can sometimes be used interchangeably with caravan, which in the U.S. is referred to as a travel trailer. The British term people mover is also used in Australian English to describe a passenger van. The American usage of van to mean a cargo box trailer or semi-trailer is used rarely, if ever, in Australia. In India, the van is one of the most common modes of transport and is often used for transporting school children to and from schools, usually when parents, especially working parents, are often too busy to pick their children up from school or when school buses are full and unable to accommodate other children. Early Japanese vans include the Kurogane Baby, Mazda Bongo and the Toyota LiteAce van. The Japanese also produced many vans based on the American flat nose model, but also mini-vans which for the American market have generally evolved to the long-wheelbase front wheel drive form factor pioneered by the Nissan Prairie and Mitsubishi Chariot. Microvans, vans that fulfill kei car regulations, are very popular for small business. The term is also used to describe full-fledged station wagons (passenger car front sheetmetal, flat folding back seats, windows all around) and even hatchbacks with a basic trim package intended for commercial use. These are sometimes referred to as "Light Vans" (Japanese: ライトバン). In British English, the word van refers to vehicles that carry goods only, on both roads and rails. What would be called a minivan in American English is called a people-carrier or MPV, or multi-purpose vehicle, and larger passenger vehicles are called a minibus. The Telegraph newspaper introduced the idea of "White Van Man", a typical working class man or small business owner who would have a white Ford Transit, Mercedes-Benz Sprinter, or similar panel van. Today the phrase "man and van" refers to light removal firms normally operated by a sole business owner transporting anything from the contents of a whole house to just a few boxes. The word "van" also refers to railway covered goods wagons, called "boxcars" in the United States. In the United States, a van can also refer to a box-shaped trailer or semi-trailer used to carry goods. In this case there is a differentiation between a "dry van", used to carry most goods, and a refrigerated van, or reefer, used for cold goods. A railway car used to carry baggage is also called a van. A vehicle referred to as a full-size van is usually a large, boxy vehicle that has a platform and powertrain similar to their light truck counterparts. These vans may be sold with the space behind the front seats empty for transporting of goods (cargo van), or furnished for passenger use by either the manufacturer (wagon) or another company for more personal comforts, such as entertainment systems (conversion van). Full-size vans often have a very short hood (bonnet), with the engine block moved to within the passenger cabin. A cutaway van chassis is a variation of the full size van which was developed for use by many second stage manufacturers. Such a unit generally has a van front end, and driver controls in a cab body which extends only to a point aft of the driver and passenger seats, where the rest of the van body is cutoff (leading to the terminology "cutaway"). From that point aft, usually only the chassis frame rails and running gear extend to the rear when the unit is shipped as an "incomplete vehicle". A second stage manufacturer, commonly known as a bodybuilder, will complete the vehicle for uses such as recreational vehicles, small school buses, minibuses, type III ambulances, and delivery trucks. A large portion of cutaway van chassis are equipped with dual rear wheels. Some second stage manufacturers also add a third weight-bearing single wheel "tag axle" for larger minibus models. The term van may also refer to a minivan. However, minivans are usually distinguished by their smaller size and traditionally front wheel drive powertrain, although many now are being equipped with four wheel drive. Minivans typically offer seven or eight passenger seating capacity (similar to the smallest full-sized vans), and better fuel economy than full-sized vans, at the expense of power, cargo space, and towing capacity. In addition, many new minivans have dual side sliding doors. The precursor to American Vans would be the Sedan deliveries of the 1930s to late-1950s. The first generation of American vans were the 1960s compact vans, which were patterned in size after the Volkswagen Bus. The Corvair-based entry even imitated the rear-mounted, air-cooled engine design. The Ford Falcon-based first-generation Econoline had a flat nose, with the engine mounted between and behind the front seats. The Dodge A100 had a similar layout and could accommodate a V8 engine. Chevrolet also switched to this layout. The Ford, Dodge and Corvair vans were also produced as pickup trucks. The standard or full size vans appeared with Ford's innovation of moving the engine forward under a short hood and using pickup truck components and taillights. The engine cockpit housing is often called a dog house. Over time, they evolved longer noses and sleeker shapes. The Dodge Sportsman was available with an extension to the rear of its long wheelbase model to create a 15-passenger van. Vehicles have been sold as both cargo and passenger models to the general public, as well as in cutaway van chassis versions for second stage manufacturers to make box vans, ambulances, campers, and other vehicles. Second stage manufacturers also modify the original manufacturer's body to create custom vans for the general public. In the 1970s, songs like "Chevy Van", written and performed by Sammy Johns, and nicknames like "sin bin" or "screw canoe" became part of the culture as owners transformed them into rolling bedrooms and lounges. Conversion vans became a large market with plusher accommodations than factory seats. Dodge ended production of their full-size vans in June 2002 (as 2003 models), and replaced it with the German originated Dodge Sprinter, which is based on a narrower, more fuel-efficient European design pattern with a 150 hp (110 kW) diesel turbo I5. Typical versions of the Sprinter are taller than other unmodified vans (tall enough to stand in), with a more slanted (aerodynamic) profile in front. They have been adopted primarily for delivery and lightweight Class-C van cab motor home applications. In urban areas of the United States full-size vans have been used as commuter vans since 1971, when Dodge introduced a van that could transport up to 15 passengers. Commuter vans are used as an alternative to carpooling and other ride sharing arrangements. Many mobile businesses use a van to carry almost their entire business to various places where they work. For example, those who come to homes or places of business to perform various services, installations, or repairs. Vans are also used to shuttle people and their luggage between hotels and airports, to transport commuters between parking lots and their places of work, and along established routes as minibuses. Vans are also used to transport elderly and mobility-impaired worshipers to and from church services or to transport youth groups for outings to amusement parks, picnics, and visiting other churches. Vans are also used by schools to drive sports teams to intramural games. Vans have been used by touring music groups to haul equipment and people to music venues around the country. Another type of van, peculiar to North America, is the step van, so-called because of the ease with which one can step in and out of it. 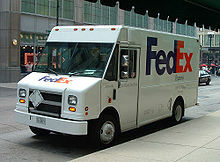 Widely used by delivery services, courier companies and the parcel division of the US Postal Service and Canada Post, they are often seen driven with the door open, especially in big cities. Step vans have more boxy shapes and higher rooftops than other vans, and are rarely employed for carrying passengers. A full-size van is a marketing term used in North America for a van larger than a minivan, that is characterized by a large, boxy appearance, a short hood, and very heavy cargo/passenger-hauling capacity. In recent times, they consistently feature a powertrain of a V8 engine, automatic transmission, and rear-wheel drive. They largely replaced the compact vans, which were introduced in the early 1960s to compete with the Volkswagen Type 2, based on their compact car components. The first full-size van was the 1969 Ford Econoline, which used components from the Ford F-Series pickups. General Motors and the Dodge Ram Van would follow suit with designs with the engines placed even farther forward, and succeeding generations of the Econoline would also introduce longer hoods. The American market is entirely dominated nowadays by the Mercedes-Benz Sprinter, Nissan NV, Ford Transit and Chevrolet Express/GMC Savana. The van body is taller than the cab and bed of the pickup that uses the same style frame and powertrain resulting in the basic van having a higher center of gravity than a similarly loaded pickup from which it is derived. The suspension is also higher because of the design weight capacity for 15 passengers of between 150 lb (68 kg) and 200 lb (91 kg), thus a vehicle may be over one ton of passengers alone. The seats in the passenger version raise the load, passengers, above the floor, further raising the center of gravity (and often shifting it rearward). The bench seats allow passengers to slide if safety belts are not used. In the United States it is common for only the front seat passengers to use their safety belts, perhaps because belted passengers feel they can still lean and shift a large amount. The U.S. National Highway Traffic Safety Administration (NHTSA) has determined that belted passengers are about four times more likely to survive in rollover crashes. Safety can be greatly improved by understanding the unique characteristics of 12- and 15-passenger vans and by following guidelines developed for their drivers, according to the U.S. National Highway Traffic Safety Administration (NHTSA). A summary of this information is available at "Reducing The Risk of Rollover Crashes in 15-Passenger Vans". Recommendations include carrying 10 or fewer passengers (preferably towards the front of the van) because that greatly reduces the risk of rollover crashes, and it suggests that repeated operation by the same drivers tends to enhance their ability to handle these vehicles more safely over time. Additionally, heavy items should not be added to the roof rack of a van as that raises the center of gravity of a generally top-heavy vehicle. Tire pressure for 12- and 15-passenger vans is another operating issue that is often overlooked, as these vans are designed to have a higher pressure in the rear tires in order to carry the heavier load safely. Vehicle manufacturers tire pressure requirements are on each vehicle's information label, usually located in the doorjamb of the driver's-side door. Underinflated tires can overheat when driven at speed and under heavy loads, causing tire failure and leading to a roll-over. Car rental companies have also started adding stickers to warn renters about the difference in handling while compared to standard cars. Many commercial vans are fitted with cargo barriers behind the front seats (or rear seats, if fitted) to prevent injuries caused by unsecured cargo in the event of sudden deceleration, collision or a rollover. Cargo barriers in vans are sometimes fitted with doors permitting the driver to pass through to the cargo compartment of the vehicle. Wikimedia Commons has media related to Vans. ^ "Van #3" @ New English Dictionary on Historical Principles Archived 21 September 2016 at the Wayback Machine, year 1928. See also "Caravan" @ New English Dictionary on Historical Principles Archived 9 August 2016 at the Wayback Machine, year 1893. Note: The word van as a vehicle, being a contraction of caravan, has no historical relation with the word van as a contraction of vanguard. ^ "School van operators take kids for a ride". Hindustan Times. 24 July 2015. Archived from the original on 16 September 2015. Retrieved 27 July 2015. ^ "Ford - Cars, SUVs, Trucks & Crossovers | Ford Vehicles | The Official Site of Ford Vehicles | Ford.com". Ford Vehicles. Archived from the original on 28 February 2009. Retrieved 20 November 2011. ^ "Passenger Van Safety". nhtsa.dot.gov. Archived from the original on 24 July 2009. Retrieved 8 May 2012. ^ "15-Passenger Van Safety Whitepaper". brightfleet.com. September 2013. Archived from the original on 11 January 2014. Retrieved 10 January 2014.